As our headquarters and city of origin, Richmond has always held a special place for Data Control. It is here where we have had some of our biggest clients and where have a performed some of our best database development work. 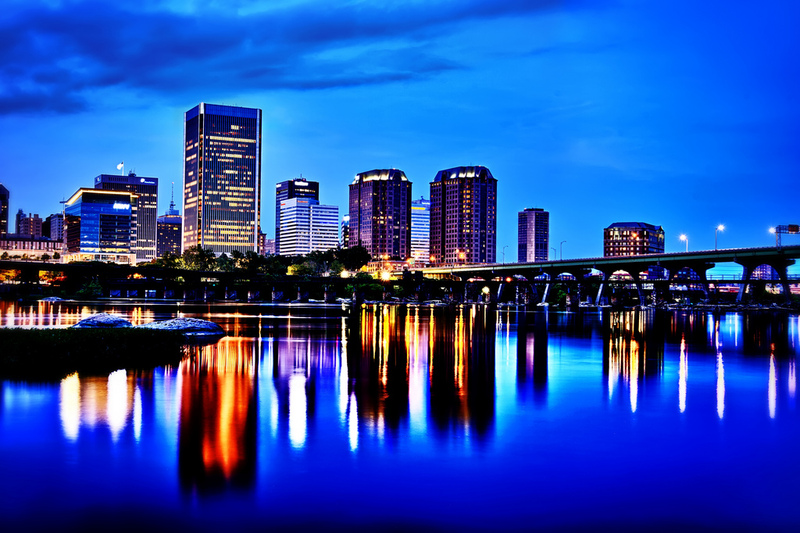 The custom database programming we have provided for the Fortune 500 clients in Richmond has yielded some of the most efficient and effective data management solutions to be found. Hospital Hospitality House Richmond, Virginia Developed Access database for charity hotel organization. This hotel management application interacts with both a Topaz Signature pad for capturing hotel guest signatures as well as Adobe Acrobat and for producing .pdf files. Strategic Technology Systems Richmond, Virginia Adam Mears, owner of STS contacted me to build an Access database for his client, The Snead Company, a commercial window supplier to the commercial construction industry. Glave Firm, The Richmond, Virginia A NATIONALLY RECOGNIZED ARCHITECTURE, interior design, and planning firm, Glav� & Holmes Architecture was founded in 1965 in Richmond, Virginia. The firm of 60 architects, interior designers, historic preservationists, and supporting staff, maintains a diverse and integrated portfolio demonstrating expertise in numerous market areas, including Higher Education, Cultural, Civic, Hospitality, and Residential. Clients are provided with comprehensive services whether projects involve new buildings, additions to buildings, renovations, or adaptive reuse. France Environmental Richmond, Virginia We built France Environmental and Access database for importing leads from Peachtree And Outlook to generate sales/marketing emails that come from the Access Database and Integrate with Outlook. Roofing Consulting Services Richmond, Virginia Commercial Roof Consulting Firm. The Company sends crews across the country to photograph and notate deficiencies in commercial roofs. That data is centrally collected, entered into the Access Database we support, and generates complex, 70 page .pdf file reports. The database gives the user the options to manipulate the sections of the reports prior to creating the .pdfs. We use VBA code to automate the .pdf file creation process. MatlenSilver Group ltd. Richmond, Virginia MatlenSilver Group, Inc subcontracted us to their Fortune 500 Tobacco /Food Manufacturing Philip Morris (now Altria) for Manufacturing Training Tracking in Richond, VA.
VibrAlign Richmond, Virginia Distributor of Vibration Analysis equipment to manufacturing firms. Access database connects to outlook to schedule training and equipment deliveries for that training. Connects to Navision to retrieve customer and contact information. This Access database also integrates heavily with Microsoft Outlook, providing both calendaring and email functionality VibraAlign is in Richmond VA and has clients across the country including Texas, California, Utah, Colorado, New York, Florida and Illinois. Chase M. Adkins, Jr. CPA Richmond, Virginia We built an Access Database for Chase Adkins. Chase Adkins is located in Sandston, Virginia. This organization primarily operates in the Certified Public Accountant business / industry within the Engineering, Accounting, Research, and Management Services sector. This organization has been operating for approximately 27 years. Chase Adkins employs 1 people at this single location. Mulit Interest Services Group Richmond, Virginia MISC is a company that services the Import / Export industry. They specialize in getting your goods into the United States and out of the United states. The Access Database we've built tracks the process of containers coming in and out of the country including invoicing, transportation, payments, warehousing, etc. Capital One - Art Richmond, Virginia Build Access database for Fortune 500 credit card company. Database tracks artwork throughout company. About Capital One: We are a Top 10 U.S. bank, with the strength and stability to meet the needs of your business. Our Commercial Banking group services a $65 billion loan portfolio and more than 6,100 clients. Let us show you the difference our partnership and proven experience can make. Chase, Inc - HVAC Richmond, Virginia Build Access database to track heating/air conditioning clients and deliveries and installations. This is a Mechanical Engineering Firm in Chesterfield, Virginia (a suburb of Richmond, Virginia). About Chase HVAC: Mike Burton has been with Chase, Inc. in Richmond since 1982 and is the sole owner. Unlike many heating/air and plumbing companies, at Chase, you will not be treated like �just another customer.� Chase strives to keep its �Mom and Pop� reputation in Richmond over the years. If you�d like to speak directly with Mike when you call, it�s no problem. He is never too busy to speak with you. Otherwise, our office staff is more than glad to take your call and schedule an appointment to meet your heating/air and plumbing needs. We appreciate your business and look forward to continuing to serve you and your family for many more years to come. Burnstone Computer Services Richmond, Virginia Subcontract to build Access databases for associations and retirement home management: Masons of Virginia. This Access database keeps track of the membership for the Virginia Masons. It provides invoicing functions and tracks the current positions of each Mason within their lodges. UpTime Solutions Professional Services Group Richmond, Virginia Network Engineering Firm in Richmond, Virginia. West Broad Hyundai Dealership Richmond, Virginia West Broad Hyundai is an Auto Dealership in Richmond, Virginia. Atlantic Constructors, Inc. Richmond, Virginia Build a Microsoft Access database in Chesterfield Virginia to determine pricing for this Mechanical Engineering firm. Developing this Pricing Access database was critical for their operations. About Atlantic Constructors, Inc: ACI works across the spectrum of business and industry,�from busy production facilities, power plants, and the many factories in the Mid-Atlantic, to commercial and government buildings, universities, hospitals and specialized laboratories. Our customers know we can be counted on not just to get the job done, but to get it done right, safe and on-time. Networking Technologies and Solutions Richmond, Virginia Network Engineers in Richmond, Virginia. NTS has subcontracted us many times to build Access & SQL server databases to the Virginia Lottery, the Virginia Beach Fire Department, Townes Engineering, EHS Laboratories and more. For the Virginia Beach Fire department, we built a Microsoft Access truck inventory database. Masonomics Richmond, Virginia Microsoft Access Database for a commercial mason that sends text messages, connects to SQL Server web database for mobile web pages, and retrieves Timberline project information for project resource scheduling. This is one of the most complex Access Databases we've built considering the number of integrations with other systems. Strategic Technology Systems Richmond, Virginia An Access database with a SQL Server back end was already in place at CeMark, STS's client. We were asked to migrate the data file to a new version of SQL Server and modify the existing Access database with a bunch of punch list items. Convergent Business Solutions LLC Richmond, Virginia Convergent is a consulting firm in Richmond, Virginia. We partnered to build an Access database for their Retirement Home client: Virginia Baptist Homes, a retirement community. Shaheen Law Group Richmond, Virginia Modifying existing Access database that performs document mangement for the firm. AVB Solutions Richmond, Virginia We were subcontracted to build Access database for their healthcare client: Veteran's Hospital in Richmond, VA. This Access database helped hospitals run their operations as was rolled out to a consortium of healthcare operations in Virginia, Maryland, and DC. E.I. DuPont - Nashville Payment Center Richmond, Virginia Delivery of MS Project file including timeline. Delivery of Proposal for completion of project. Delivery of Data Description and Application Navigation Excel File. Virginia Community Policing Institute Richmond, Virginia Virginia Community Policing Institute provides training material to police organization across the United States. We worked with them to build and Access database that would track which individuals received what training. This database also reminds VCPI that training is about to expire for certain individuals. Capital One - SarbOx Richmond, Virginia Build Access database for Fortune 500 credit card company. Capital One - Reservations Richmond, Virginia Build Access database for Fortune 500 credit card company. Capital One - Team Trident Richmond, Virginia Build Access database for Fortune 500 credit card company. Bill Judge and Associates Richmond, Virginia Build Access database to import .csv files of clients for Insurance Agent. Assura, Inc. Richmond, Virginia The purpose of this project was to develop a database for Assura that calculates the Residual Risk for vulnerabilities defined by clients of Assura. Scope: The project is expected to be developed using 8 tables, 9 forms, 1 report (actually the function to link the results to a MS Word document). Queries will be developed as needed to complete each object. Each form will be reviewed with the customer upon completion. Some of the functions may be incomplete at that time as it may be dependent upon completion of other objects. The review will be done to secure approval for the layout of the form as well as the functions that are working at the time of review.